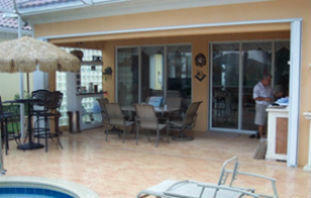 Protect your family and property with cost effective accordion hurricane shutters. Storm Guard Solutions provides accordion hurricane shutter systems that protect you, your property and your possessions from catastrophic damage. Your home or business is your most valuable asset and living in Florida it’s not a question of IF we will be subjected to intense storms or hurricanes. It’s more a question of WHEN. If you are looking to invest in accordion hurricane shutters to protect your home or business, call the professionals at Storm Guard Solutions. We are here to serve you and provide quality accordion hurricane shutters so that your home or business is ready in the event of a hurricane or tropical storm. Storm Guard Solutions is a Naples based, family owned and operated company that has provided leading edge hurricane protection and service in Estero, Florida since 2004. Don’t get Caught Unprepared. 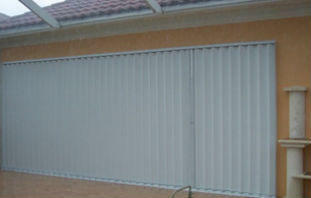 Our Accordion Shutters are Strong, Simple, Easy to Use, Affordable, and Provide Protection! An accordion hurricane shutter system is custom built for the openings of your home or business, and to provide protection from hurricane force winds and flying debris that can compromise your structure. It only takes a small opening to allow forced entry of water in to your property. Our shutters meet all the standards of ASTM E 1866, E 1996, International Residential Code as well as State building codes and are tested to withstand a Category 5 hurricane. What are the Advantages of Accordion Hurricane Shutters? Why Choose Storm Guard Solutions?